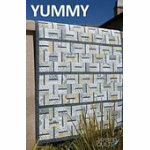 Yummy is a ideal project to use precut 2.5" strips. If you want more variety, add in additional strips. choose a sashing fabric that has a strong contrast with the 2.5" strips and you'll have a Yummy quilt King, Twin, Lap and Baby sizes.